The high point of any Old Ghost Road experience! Enjoy a night dining and luxuriating at the Rough and Tumble Bush Lodge before setting out along the northern end of The Old Ghost Road, up the Mokihinui Gorge to a pre-arranged helicopter rendezvous later that day. From here, prepare to be blown away by the scenic flight (with all your gear) as you are lifted to the top of The Old Ghost Road, landing at your destination for the night, Ghost Lake hut. Cross your fingers for one of Ghost Lake’s world-class sunrises the following morning and then set off on 30km of glorious (mainly) downhill riding or hiking to where your shuttle transportation or your own vehicle awaits. Return ground transportation from the Lyell Reserve to theRough and Tumble Bush Lodge OR relocation of your own vehicle from the Rough and Tumble Bush Lodge to Lyell Reserve. Note: Mountain bikes, bike tools and parts, personal items such as sleeping bags, toiletries, outdoor wear and on-track meals are not included. Self-drive to your accommodation destination for the evening – the Rough and Tumble Bush Lodge nestled at the base of the Glasgow Range and overlooking a bend in the mighty Mokihinui River right at the northern terminus of The Old Ghost Road. The Rough and Tumble Bush Lodge features deeply comfortable accommodations, extensive decks, a large stone fireplace and dining tables hand-hewn from native woods milled onsite. Your hosts provide a hearty two-course meal and tales of The Old Ghost Road. Local beer and wine is available for purchase. After breakfast,coffee and an equipment check, you are set to go! Your bike ride or hike up the stunning Mokihinui Gorge takes you directly from Rough and Tumble Bush Lodge, over County Hill (the only significant hill of the day), above the confluence of Rough and Tumble Creek (the historic pack track up to Karamea), through old gold workings at Seatonville, and dramatic cantilevered bridges over earthquake slips. Your lunchtime destination (2-3 hours by bike, 4-5 hours on foot) is Specimen Point Hut, at a scenic promontory overlooking rapids at the head of the Mokihinui Gorge. Enjoy your lunch on the deck in the sun or inside the cozy hut. By prior arrangement, either press on from here to a subsequent rendezvous location or meet your helicopter transport for a stunning trip (with all your gear) up to Ghost Lake Hut – your destination for the evening. Ghost Lake Hut (1180 metres above sea level) is the high point of The Old Ghost Road and, for many, the pinnacle of their journey. Built in 2012 by volunteers, the hut boasts extensive views across the northern part of the South Island and is known for its spectacular dawns and dusks. Your accommodation tonight is New Zealand backcountry-hut style bunk beds with a communal cooking and gathering area. Cooking equipment and potable water are provided. Share your stories over the light of the wood stove with fellow Old Ghost Road adventurers, or read a book by candle or torchlight, before turning in for the evening. Cyclists, prepare yourself for an epic downhill! 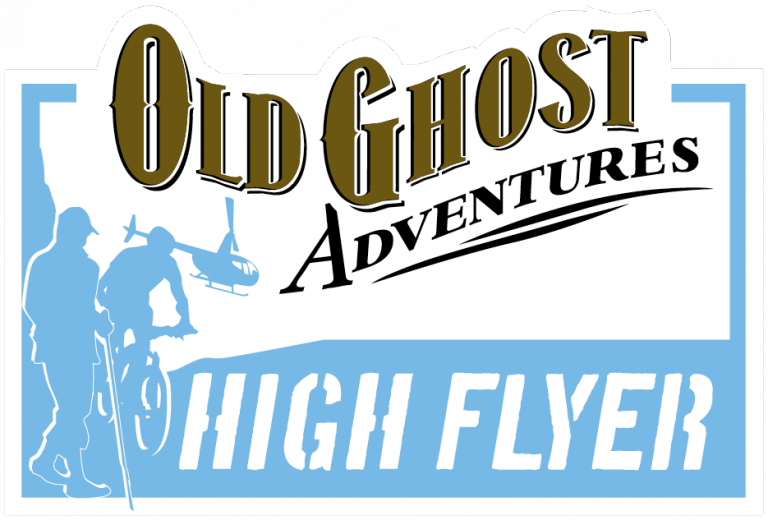 Today you will bike or tramp just under 30km, descending 1200m to the southern end of The Old Ghost Road, to the historic goldmining settlement of Lyell. From Ghost Lake Hut, the first 2 km’s involve an honest climb (120m) as you wind your way up and around the flanks of the magnificent Rocky Tor to ‘Heaven’s Door’ – the highest point on The Old Ghost Road. Care is needed here with exposure and steep sides. From Mt Montgomery to Bald Hill and beyond, it’s all down hill with a few switchbacks thrown in for good measure. Stop at the Lyell Saddle hut for a break and extensive views of the eastern Glasgow Range, then continue steadily down through bush and several goldmining ghost towns, high above gold-laden Lyell Creek. Today may be a quick day for some riders, but we encourage everybody to take their time, plenty of photographs and be mindful of uphill users. The average ride time from Ghost Lake to Lyell is in the order of 3-4 hours; tramping time 7-8 hours. Depending on your preference, we will either have booked your ground transportation to meet you at the Lyell Campground to drive you back to your awaiting vehicle at the northern end of the trail, or we will have your relocated your vehicle to Lyell and it will be waiting for you.